Toff is a gorgeous (OK so I’m biased!) ginger and white 15 year old rescue cat. I had no experience of diabetes but I knew something was wrong. We noticed that Toffee was drinking and weeing a lot and having lost other cats to Chronic Renal Failure (with Chronic Renal Failure - or CRF - they also wee and drink a lot) I had a full blood panel run on Toff to check for kidney failure. His numbers came back fine with only mild anaemia detected. But something was still clearly wrong, though I couldn’t put my finger on what it was. It wasn’t until I bumped into a UK person when she appeared on the CRF list that I began to get an inkling of what was going on. As luck (?) would have it her cat has diabetes as well as the Chronic Renal Failure and when I wrote offering her support, I mentioned Toffee’s condition and it rapidly turned round to her supporting ME! At this point I had no idea it could be diabetes but she kindly sent me some Keto-Diastix testing strips, almost just for fun. It took days for Toff to cooperate and do me a wee I could catch! When I finally did, I was horrified to see that the strip turned to the darkest colour possible! So off to the vet! As luck would have it, this coincided with a very rapid decline in Toff’s health he began being unable to walk and was a very, very sick cat indeed. Looking back I thank God that Cheryl sent me the strips in time. The results took forever to come back. Why is this? In my case I knew the director of the testing lab so I was on the phone almost every day pestering for results. I was mad and worried as hell and Toff was getting weaker and sicker by the day. By this time he had pretty severe neuropathy in his back legs and couldn’t walk at all. I had to hold him in the litter tray or he’d collapse. I felt so awful and helpless for him. Toff was diagnosed on the 13th June 2002 and started on PZI insulin on the 14th. I have to say that again I was very lucky. Cheryl had briefed me so well that I knew what to expect and best of all I knew what questions to ask the vet. Generally I’ve found that vets (well most of them anyway) are OK as long as you seem to know what you are talking about. For some reason if you do your research and find out as much as you can then they are more willing to listen and respect your input. Even so I did still find I had to haggle with the vet. He wanted to start Toffee on four units, which I’d found out is a bit high to start off with. Better to start low and monitor and then work your way up by small increments gradually. So I said two! The vet said three, I said two and a half? He said well, if you give the homoeopathic remedy (syzygium) then I agree to two. I forgot to mention that he’s a homoeopathic vet! So two units. I won’t pretend giving my first injection was easy! I’d had experience with doing subcutaneous injections for Ham’s kidney failure, so in theory I was OK with poking needles into cats. But I can tell you I still felt very afraid. I mean really scared! Luckily I had Cheryl’s straightforward calm advice telling me what I needed to do and reassuring me that I could do it. Just as well really, because the vet never offered to show me how and never really offered advice at all. I think that he’s basically a good vet but to be honest he, like many of our vets, doesn’t know a great deal about diabetes. After a few days I got the hang of the injections and didn’t feel quite so afraid. However managing Toff’s diabetes has not been plain sailing. I learned where I could get supplies, even insulin much cheaper than at the vets that was the easy part. Also, I’d been given a blood glucose monitor (yup! Cheryl again!) so I could test his numbers and monitor Toffee at home. Even this wasn’t straightforward because my vet doesn’t really approve of home testing (we’ll convert him yet, you’ll see!) I think he feels slightly threatened by people being knowledgeable and doing things at home for their cats so he wasn’t very supportive. The thing scared me half to death and it took me a long time to get used to it, mainly because I was even more nervous of that than injections. I had to have lots of support from Cheryl and the Feline Diabetes Message Board! I’m so tremendously glad that I did do the home testing though, even if it was a bit tricky to get the hang of. Toff proved extremely difficult to stabilise. We tried various different doses 2, then 2.5 then back down to 1.5 then up to 3 and eventually we crept up to 4 units once a day. It seemed so frustrating and disheartening whatever I did it seemed that Toffee’s numbers still stayed horribly high. This went on for months and although I did try to be patient (I’d read that it can take weeks or even months for them to stabilise) I did really get worried about him, he was still so weak and ill. 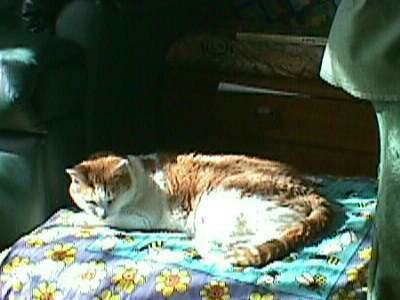 I knew that the insulin was helping him because one day I missed and the insulin didn’t go in, and poor Toff was so droopy and unwell looking that day he hardly moved at all. I tried everything to help stabilise Toff. I reduced the amount of dry food he was allowed and tried to follow a more high protein diet, and I even began partially feeding a raw diet. I feed little and often and I hoped that this would at least avoid or reduce the food spikes for Toff. I gave the homeopathic tablets, vitamins (from the US) and pet tinic (also for the US) and I tried orchid flower essences and also methylcobalamin for the back legs. Honestly, I thought in exasperation.... I couldn’t be trying any harder if you paid me! But still Toff’s numbers stayed in the high 20s or even 30s. There seemed no pattern, no consistency we’d get the occasional day where he’d have a good 18 and this would come down to say 15 or 12 if we were really lucky. But next day the numbers would be right back up in the 30s again. I was desperate by now, as we’d had the talk with the vet. We’d agreed that we’d keep Toff as well as possible for as long as possible but we had to accept that with high numbers like this damage was still being done by the diabetes. I felt so sad for Toff. We’d rescued him and wanted him to have a long and happy retirement in his new home with us. I felt like I’d failed him. I felt I had just two options left to try. 1) going twice daily with the injections or 2) trying to cut out ALL dry food altogether. I knew that for some cats even a small amount of dry can send their blood glucose haywire. I plumped for option 2 before I tried twice daily shots, not because I was worried about doing injections twice a day. Hey, if you can manage one injection a day, two’s a cinch! What worried me was that I’d seen that even when we were up to 4 units it hadn’t shifted those figures, so I was concerned that twice daily may not be the entire answer for Toffee. I still needed to try to bring those figures down even if I switched to twice daily injections. Toff was totally addicted to his dry food and he was not a happy bunny to be denied it! I felt mean as hell too, which explains why I’d put off confiscating his dry for so long. But as I say months had gone by and I was desperate! Needless to say the very next day for the first time Toff gave me a brilliant figure 8.7! Wow I didn’t dare believe that the blood glucose monitor was working properly! After all the disappointments I didn’t dare think that this time the figures would be consistent. Stabilisation seemed like an impossible dream! I was scared the next day as I watched the monitor count down. We’d NEVER before had good figures two days running. But hey 6.9! Brilliant! You couldn’t find a happier, more relieved cat Mum in the world! I wanted to shout and tell the world! This time the numbers stayed good - no dry food for Toff, but good numbers for mummy! Toff is beginning to feel and look so much better! He’s like a new cat. He plays and is silly and really is beginning to look well. As I write this it is still early days we’ve only had this stabilisation for about a week. God I pray that it lasts! We did try once to do without the insulin altogether. Think how nice that would be, I’d save so much money, no insulin (£28 per 6 weeks) no syringes, no expensive supplements... Sadly, when we tried to go no insulin Toff’s figures were right smack-bang up in the 20s next day. So now Toff has one unit a day and his Mummy is still very grateful for that thank you. My advice to anyone new to diabetes is to learn as much as you can and to never give up hope. Sometimes when you think you’ve tried everything it’s the simplest little change that will work and bring you that longed for stabilisation.